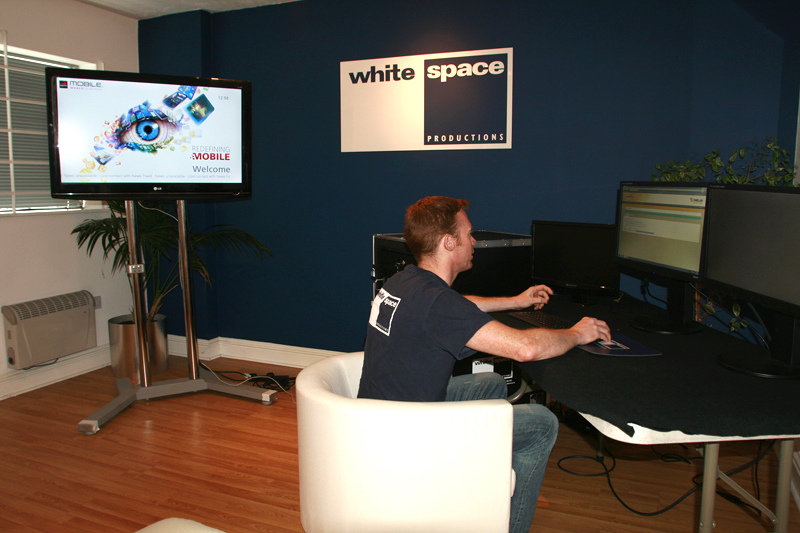 White Space is a creative production management company, providing a wide range of production services. The company offers a portable event digital display system; all of the equipment that is required to create a solution is hired to a client just for the duration of an event. Although White Space has produced some of the world's largest events, they are also capable of competitively supplying even the smallest ones. One of the major events that White Space has provided digital signage for is GSMA Mobile World Congress, the annual gathering of the mobile industry with 60,000 senior mobile leaders from 200 countries attending the event. GSMA represents the interests of mobile operators worldwide. Spanning more than 220 countries, the GSMA unites nearly 800 of the world’s mobile operators. It was very important for GSMA to have flexibility onsite at their World Congress. They chose digital/electronic signage to help them react to ever changing needs of a live event with particular emphasis on ad hoc onsite changes. GSMA also wanted the ability to communicate these effectively to their delegates. Digital signage was the only way of displaying the dynamic digital information GSMA wanted to share with their delegates. The ONELAN system was the only system that could offer a combination of both digital signage and IPTV in real time. · At least 2 screens outside each meeting room detailing the agenda for that session. · Potential to stream footage of what is going on in the room should it become full. · The control system needed to be housed in the speaker testing room in the venue. · The system needed to include 22 x 42” Plasma screens clustered into 10 working groups throughout the venue. · The info relayed had to be formatted into agreed template form in line with the Mobile World Congress event brand. Two ONELAN Net-Top-Box (NTB) 5500Ps were used: one to publish content to ONELAN NTB 620S’s driving the screens and one for use as a spare authoring station, for monitoring and as a spare NTB. A central control area was set up on site. The System was a great success and surpassed the expectations of GSMA. Over the four days of the event the system conveyed over 1500 unique digital messages across ten groups of screens as well as fulfilling numerous ad hoc updates. The GSMA represents the interests of mobile operators worldwide. Spanning more than 220 countries, the GSMA unites nearly 800 of the world’s mobile operators, as well as more than 200 companies in the broader mobile ecosystem, including handset makers, software companies, equipment providers, Internet companies, and media and entertainment organisations.